Which is why YOU should go buy one. At its price, the Chevrolet Corvette is a performance bargain, which is why the. A new Corvette is already one of the cheapest entries into the world of sports cars, though used ones can be an even greater value. This doesn't mean all Corvettes are what we'd call affordable. If you , the 755 horsepower ZR1, you'll have to . 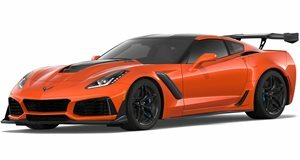 Paying over $100,000 for a Corvette may be a bargain compared to most European sports cars but remains out of reach for the average car enthusiast. So what if a run-of-the-mill Corvette just isn't cool enough but you only have a limited budget for a fun car? Might we propose a C4 generation ZR-1? The C4, much like an NB Miata, is . It doesn't feel nearly as modern as the C5 or C6, nor does it have the classic looks of a C2 or C3. In fact, the entire era of the C4 (1984-1996) has never been looked at fondly as a great period for automotive design. But that has all changed in recent years. With children from the '80s and '90s now earning bigger salaries and having some disposable income to throw around, cars from this era are now starting to be worth big money. As an example, a . This phenomenon is currently being referred to as the "Radwood Effect" - Radwood being a popular car show dedicated to cool cars from the '80s and '90s. Cars from this period will all soon start to appreciate as cars from the '60s and '70s did earlier but it's not too late to catch the C4 ZR-1 on the upswing. If you want to buy a cheap Corvette, the C4 has always been the best choice. Since few people looked upon them with fondness, the more rough examples could be found for just a few grand. The ZR-1 is the ultimate pinnacle of the C4 generation, so you will have to pay significantly more for one - but not too much more. Even the most pristine examples - we're talking fewer than 10,000 miles on the odometer - can be found for less than $35,000. Want one with closer to 100,000 miles? You're probably looking at around $15,000 (if you can find one). Considering that the ZR-1 sold for $66,278 by its last year in 1995 and some dealers successfully marked them up to $100,000, their current prices seem fair. We think $20,000 to $30,000 is a pretty reasonable cost of entry to be crowned as king at the next '90s car show you attend. Who knows, maybe the ZR-1 will eventually appreciate back to that $100,000 price some day. So what makes a ZR-1 any different from a normal C4? A lot, actually. Back in 1986, General Motors acquired UK automaker Lotus and set out to use the company's handling expertise to create the ultimate European sports car killer. Lotus went to town making the Corvette as good as it could be, which involved creating a new V8 engine called the LT5 using advanced features like an aluminum block, four overhead camshafts, and 32 valves. This engine was so advanced, GM soon found out that the Corvette plant in Bowling Green, Kentucky was unable to produce it, so it had to be outsourced to the Mercury Marine Corporation. The result was 375 horsepower from 5.7 liters, which was later upped to 405 hp with new cylinder heads, exhaust system, and valvetrain. In its day, the ZR-1 was one of the fastest cars in the world with a 0-60 mph time of just 4.4 seconds and a top speed of over 180 mph. In the past, the biggest downside to owning a Corvette was its cheap interior, which never felt as nice as a European sports car. Modern Corvettes have come closer to eliminating this issue but there's not getting past the C4's woeful '90s interior controls. The C4's cabin looks incredibly retro by today's standards, giving it a unique cool factor. Sadly, this doesn't stop the interior from feeling cheap, so to enjoy it, you will have to let nostalgia fog your senses quite a bit. We especially love the optional red leather seats, though we have heard they can be uncomfortable on long drives. This being a Corvette, it is actually more practical than you think. The ZR-1 was only offered as a fastback coupe, meaning it had a large glass hatch that opened to reveal around 13 cubic feet of cargo space. For the time, the LT5 engine wasn't even particularly terrible on fuel with EPA ratings of 17 mpg in the city and 25 mpg on the highway. Combine the practicality and efficiency with the ZR-1's legendary dependability and you've got the perfect collector car that you could even drive every day if you wanted to. The C4 Corvette may not be the most sought after model but we believe the ZR-1 is special enough to be secluded from that stigma. Chevy only built 6,939 of them during a six-year run, making them rare enough to be collectible but not so rare that it is impossible to find parts. Judging by the skyrocketing prices and popularity of '80s and '90s cars, we don't think it will be long before ZR-1 values start to come up, which is why now is the time to buy one. Chevrolet is sending off the C7 generation with the all-powerful Corvette ZR1 model, and it's properly insane.